What Makes a Good Socket Set? A socket set contains a variety of different socket sizes along with a socket wrench that is used to either apply or remove bolts. Sockets come in both standard and metric sizes. A socket set may contain one or both sets of sizes, depending on which set you choose. Bolts are one of the most popular and effective ways of securing materials together. They can create a secure structure for materials such as wood, metal, laminate, and other materials. One example of a job that a bolt and socket set would perform is removing and replacing tires on a vehicle. A socket set would be an effective way to perform this task and ensure the bolts on your vehicle are tightened properly ensuring driving safety. Socket sets are very effective for both tightening and loosening bolts. A set allows you to choose the correct size for your job allowing you to have the precise bolt size tool required. Top quality socket sets may also have different depth ranges and the ability to adjust the wrench to fit tight spaces. If you come across a bolt that needs to be removed or replaced and the tool is too small or too large, you run the risk of damaging and warping the bolt. There will also be the risk that the bolt may not be tightened to the capacity needed to safely and effectively hold your materials in place. Another great aspect of socket sets is that there is no need to own a wide variety of wrenches to perform each job, which would be more expensive and time consuming trying to search and find the correct wrench for each individual bolt size. Sockets also provide a more exact fit for each bolt size than an adjustable wrench, which prevents stripping. A socket set generally contains one or two socket wrenches and the various sockets all easily and comfortably attach to the head of the single wrench for maximum convenience and time saved on your work load. We have researched and evaluated the top 35 socket sets on the market and the Stanley 92-839 black chrome 99-piece set was the best overall in price, durability, and functionality. 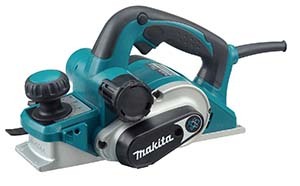 It offers a Max Drive design which provides 15% more torque than traditional socket sets. The laser etched sizes are easy to read and the black chrome finish resists rust and corrosion. It includes a convenient tool case and a lifetime warranty on the entire set. The Stanley 92-839 black chrome 99-piece set adds high quality materials with convenient features that will meet all your socket needs. Sockets and socket wrenches are very easy tools to use and can be used by anyone who does any kind of repair work. Need to adjust a bicycle chain, or put a toy together, a socket set will do the trick. Buy a new grill and need to assemble it, the socket set will be the go-to tool. Homeowners, and adults who do repairs will find a socket set invaluable. Those in the trades of auto mechanics, construction, wood working, electrician, and plumbers will all use sockets on a daily basis. A socket set is one of the tools found in any basic tool set and is typically one of the first tool sets purchased when you are building up a collection of must have tools. There are many aspects that make up the best socket sets. The first being a wide variety of socket sizes. When choosing the best socket set find one with a large variety of socket sizes for the simple fact that bolts come in a wide variety of sizes depending on the application. You may come across a child’s toy that needs repairs. This might have a very small bolt, compared to a large bolt used for securing a deck. Socket sets come in standard (fractional inches) or metric (millimeters). Unfortunately, the type of socket needed will most likely be determined by where the item was manufactured. With much of the world using the metric system, and the US using standard measures, it is essential to have both standard and metric sizes, as they are not interchangeable. The next feature you’ll want to review is the torque. Torque is the force that allows you to drive your bolts in and out with. Without high torque ratings your tools can break, warp, receive damage, or be unable to break tightened bolts free or tighten them properly. Once bolts have been secured, they can be very difficult to remove, especially if they have been outside or exposed to weather. Another great quality in a socket set is anti-corrosion material or corrosion resistance. If the sockets get rust on them, they will need to be replaced, and this is not generally covered under the warranty. We can’t always guarantee the work conditions are going to be dry so having a corrosion resistant socket set will protect your tools and make them last longer even if they become wet or come in contact with liquids such as grease or oil. A carrying case is another essential feature to any quality tool set. With so many pieces to a set it would be difficult to keep up with all the sockets without a good case. 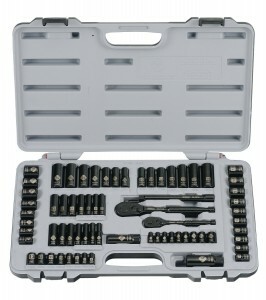 Most socket sets come in carrying case to help you keep up with your tools. The carrying cases not only provide a convenient and compact way to take your tools on the go, but also provide a way to stay organized. In most cases each socket has a precise position in the case which is also labeled so you can find the right size when you need it. If you have ever had sockets lying in a tool chest, or a loose box you know the hassle it can be finding pieces quickly and efficiently. Lastly is the warranty. 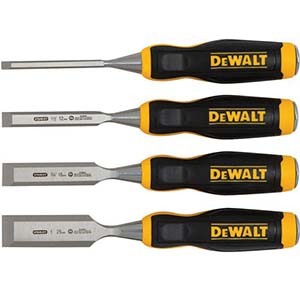 When working with tools you want a tool that will last a long time, but having a warranty in place to protect your investment, will keep your set complete. Warranties generally cover the tool if it becomes damaged, but does not cover losses. We began our research by first conducting a general search for socket sets. In doing this we were able to determine what features and quality’s make up the best sockets such as durability, available socket sizes, carrying capacity, wrench durability, customer satisfaction and many more aspects of tool selection. Following this we reviewed tool blogs, forums, magazines, and received expert advice which allowed us to determine the best brands and models of the currently available socket sets. We then consulted with confirmed customers and viewed vast amounts of customer reviews to find out which socket sets held up best in real world performance and heavy duty jobs. 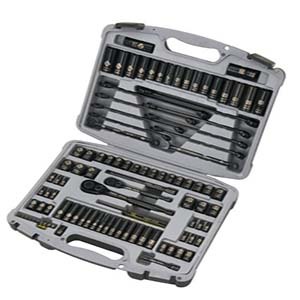 The Stanley 92-839 black chrome 99-piece set features a proprietary max-drive design and a unique radius corner design which allows for up to 15% more torque than traditional socket sets. This feature makes it easier than ever to tighten bolts and simplifies the turning of rounded corners. The max-drive design also contributes greatly to reducing fastener wear without contact on the outer 5% of the bolt or fastener which lessens your chances for warped or damaged bolts. This also prevents slipping on frozen or rusted bolts providing you with a more controlled and firmer grip. The sockets and wrenches are constructed of high alloy steel and are heat treated and finished in high polish chrome providing maximum performance for every job or project, as well as a high profile design. The sockets are made of black chrome which provides additional corrosion resistance. The size stamp is lazer etched making it easy to read and highly visible. The wrenches have a quick release latch that allows you to change bits with one hand. This set includes 33 ¼ inch Max Drive sockets and 39 3/8-inch Max Drive Sockets. Both Metric and standard sockets are included at a ¼ inch and ½ inch depths. Metric sockets range from 7 to 13 mm for the ¼ inch depth and 10 to 18 MM for the ½ inch depth. All the pieces of this set meet or exceed ANSI specifications ensuring the quality of the set. The case can be separated into 2 pieces allowing you to store them safely in a drawer or travel to a job. You also gain a lifetime warranty so if there is ever a problem with a socket you can have it replaced. If you are looking for a more complete socket set with a high level of durability, then the Craftsman 220-Piece Mechanics Tool Set would be a great upgrade. This set features both metric and standard measures for both deep and standard depths. The set includes 128 different sockets, 41 screw driver & nut driver bits. 3 quick release ratchets, and 6 wrenches. The set includes ¼. 3/8 and ½ drive sizes. All crafted from stainless steel for maximum durability and torque. A carrying case that will withstand impact making the pieces easy to store and keep up with. The lifetime warranty offers an assurance that this will be the only socket set you will ever need to buy. As with any tools safety should be considered to reduce accidents and damage to the tools. 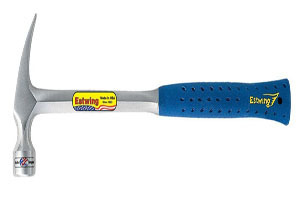 Maintenance will help the tools last as long as possible without needing replacement. We have complied a short list of safety tips and maintenance tips to keep yourself and those around you safe while using your new tools, as well as providing useful information for caring properly for your socket set. Only use your socket set for the job it was intended. Use protective gloves to allow for better grip and control of your wrench and sockets. Be aware of sockets that make have fallen and check surroundings before retrieving them. Do not try to pry bolts that have become warped or rusted. If they break you may need a power tool to remove them. Be cautios about adding too much pressure when removing a bolt. It may be necessary to spray bolt with compound such as WD-40 to loosen bolts that are overly tight. Do not leave your tools outside for long periods of time or in places where they may become subject to weather damage. Always store your sockets in a cool dry place. Discontinue use if and of sockets become bent or broken. Socket sets are very handy tools that are found in most tool collections. 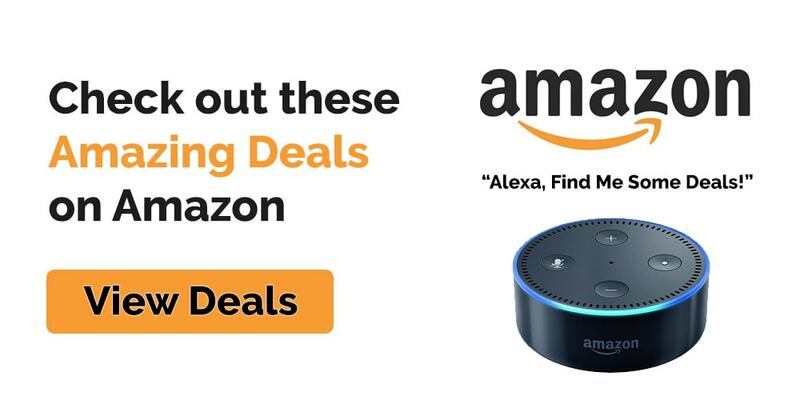 They are used by both beginners and professionals and can complete numerous tasks, making them very versatile. Sets are relatively inexpensive and can provide great support, functionality, and durability. If properly cared for, a good quality set can last a lifetime.